#10 CGC 9.8 SS STAN LEE 1ST JANE FOSTER THOR JOURNEY INTO MYSTERY 83 HOMAGE DON GLUT STORY RICK HOBERG & DAVE HUNT ART JOHN BUSCEMA COVER, MARVEL COMICS, 8/1978 WHITE PAGES. Highest Graded Copy in the World - Only One (1) Exist. Signed by Stan "The Man" Lee. First appearance of Thordis (Jane Foster). Foster would later become Thor IV (see second note below). Jane Foster had found the Hammer of Thor? (33-page story) After some instances of her helping in Asgard against Loki and an alien invasion, she was promoted to a goddess and the hammer was given to Donald Blake, as it was supposed to. Thor got involved with Sif and Jane Foster married Odin. NOTE Story takes place on Earth-788. NOTE: This "What If" story eventually happened in the mainstream Marvel Universe (Earth-616), when Jane got the hammer and became the Mighty Thor. Item is described accurately, packaged accordingly, and high definition pictures taken to further enhance your shopping experience. Please feel confident in my reputation. I will do the same for you. Books may be damaged by the postal service please check with them if box has been damaged or book has been damaged and put in a claim with them. We will try to get you the best books possible and plenty of books are 9.8 quality but we cannot guarantee grades on raw books. Only grading companies can grade your books. All of our books are prescreened for damage and scanned prior to being sent out so that customers do not switch books. 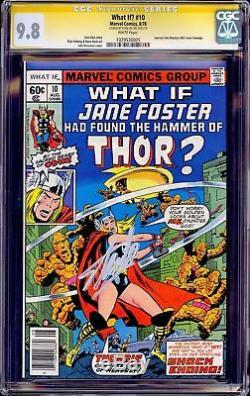 The item "WHAT IF #10 CGC 9.8 SS STAN LEE 1ST JANE FOSTER THOR JOURNEY INTO MYSTERY 83 NM" is in sale since Thursday, September 14, 2017. This item is in the category "Collectibles\Comics\Modern Age (1992-Now)\Superhero\Spider-Man". The seller is "rarecomicart" and is located in Deer Park, New York.